Copying a template is a powerful action in Skytap. With just a few clicks, you can copy an entire, complex template, including the VMs, networks, and template settings. If you need to work with templates in multiple regions, you can easily copy the template to each region. This article describes copying a template to another region. To copy a template to the same region, see Copying a template. After you’ve copied a template, changes to the copied template do not affect the source template. The source and copy are unlinked, separate resources. From the navigation bar, click Environments. Click the Templates tab. Click (More options) next to the template you want to copy. The Copy Template window displays. Select the Destination Region from the list of regions enabled in your account. If the VMs are suspended, click Proceed anyway to acknowledge that the VMs in the new environment will be forcibly powered off. The power off action is equivalent to pulling the power supply from a running computer, and it may result in data corruption in the new environment. Select a Project for the new template. For more information about projects, see Sharing resources with projects. Select Destination VPN(s) and/or Destination public IP(s). These options appear only if your template uses VPNs or static public IP addresses. VPNs and static public IP addresses are regional resources that cannot be copied with the template. If the new template needs VPNs and/or static public IP addresses, select the VPNs and/or static public IPs you want to use in the destination region. If there are no available VPNs or static public IP addresses in the destination region, you can copy anyway and attach these resources later (when you create an environment from the template). The detail page for the new template displays, but you can’t interact with it until the process is complete. If you leave the copy page or sign out of Skytap, the copy process continues automatically. Skytap sends you an email when the copy process is complete. Copying across regions can take a while. For more information, see What to expect when you copy an environment or template. For the most part, a copied template is a duplicate of the original. Almost all of the template settings (notes, labels, etc. ), VM settings (MAC addresses, hostnames, CPUs, storage, etc. ), and network settings (network subnet, gateway IP address, etc.) remain the same. There are only a few places where the copy differs from the original. For templates, these changes are visible when you create a new environment from the copied template. Skytap creates sharing portals for the new environment with the same settings and new, unique access links. VPNs are regional resources. If you do not select a VPN mapping in the Copy settings, the network in the new environment is not attached or connected to a VPN. 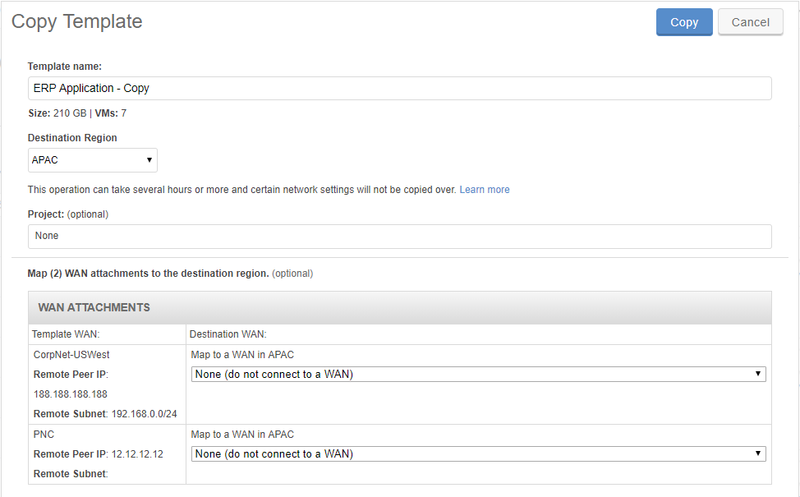 VPN mapping lets you replace the VPN in the source region with an available VPN in the destination region. Static public IPs: If you do not select a public IP address mapping in the Copy settings, the VM in the new environment does not have any attached static public IP addresses. Dynamic public IPs with DNS: Skytap automatically generates a new, unique domain name for the VM in the new environment. When the VM is run, Skytap automatically deploys an available public IP address. The VMs are in a powered off state, regardless of the VM power state in the source template. When you copy a VM on hardware version 7, 8, or 9 to US-Central, US-East-2, CAN-Toronto, EMEA, or AUS-Sydney, Skytap automatically upgrades the VM to hardware version 11. This ensures compatibility with the latest features in these data centers. To check the VM hardware version, see Checking VM hardware version. To cancel the copy operation, click Delete on the right side of the progress bar.